There are a number of different types of pallet racks that can be installed in a warehouse. While all of these racks can be used to store pallets and large products, they are not all equal. Some of these shelving systems will work much better in certain warehouses than in others, so it’s important that you determine the best type of pallet rack before you fill your entire warehouse with them. Here are some of the different questions you should answer before you make your purchase. The size of your warehouse is one of the most important factors to consider. 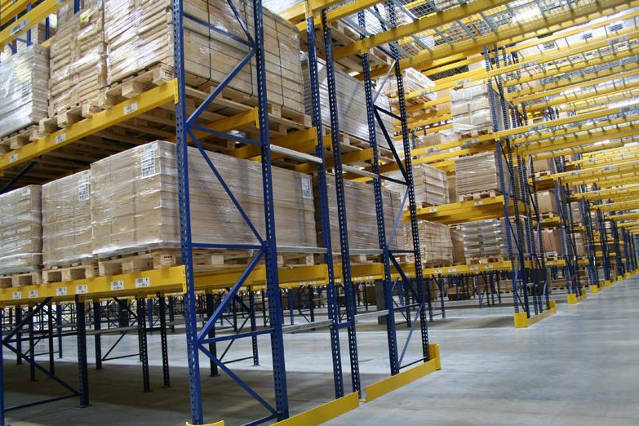 If your warehouse has a good amount of floor space, you may be able to use selective pallet racking. These racks are fairly common and generally inexpensive. They allow you to stack pallets on multiple levels as well, so you can store upwards as well as outwards. On the downside, these racks are generally shallow, so only one pallet can be stored in each bay. While this makes it very easy to find pallets and to implement either a first-in-first-out or last-in-first-out method, it also means you have to have an aisle between every row. That can take up a good amount of space, especially if you use larger forklifts that require space to turn. On the other hand, drive-in pallet racks require no aisles between the racks. Forklifts can be driven directly into the bays, and pallets are generally stored on rails on the side instead of on the cross beams. This means you can store pallets as many as six or eight deep. This warehouse racking system is loaded from the back forward, which means that only the last pallet loaded is immediately accessible. That is a major downside, but these racks do require much less space. How high your warehouse ceilings are is another factor to consider. The higher your ceilings, the higher you can stack your pallets, to some degree. You do always have to keep safety in mind, of course, and not stack pallets beyond the reach of your forklifts. However, if you can stack pallets several high, you may be able to use selective pallet racking since the space it takes up horizontally will be recouped vertically. Are you going to be storing pallets that are all roughly uniform in size and shape, or will you have some oddly-sized pallets? If your pallets aren’t all the same size, you might need to consider cantilever racking. This type of rack system allows you to store odd-sized items that may not fit in a standard bay. Finally, your forklifts may also play a role in what type of warehouse storage system you use. Forklifts that require a larger turning radius will need more space in between aisles. Those that are fairly large may not necessarily be manoeuvrable in drive-in systems. You should factor in the maximum lift height of your vehicles, how much space the need, and how many you’ll have on the floor at once when choosing your pallet racks.